Lt. Gov. Dan Patrick has announced a slate of bills he says will provide lasting tax relief to businesses and homeowners in Texas — to the tune of $4.6 billion. But there are signs he could face some opposition within his own party. Flanked by a dozen Republican senators, Lt. Gov. 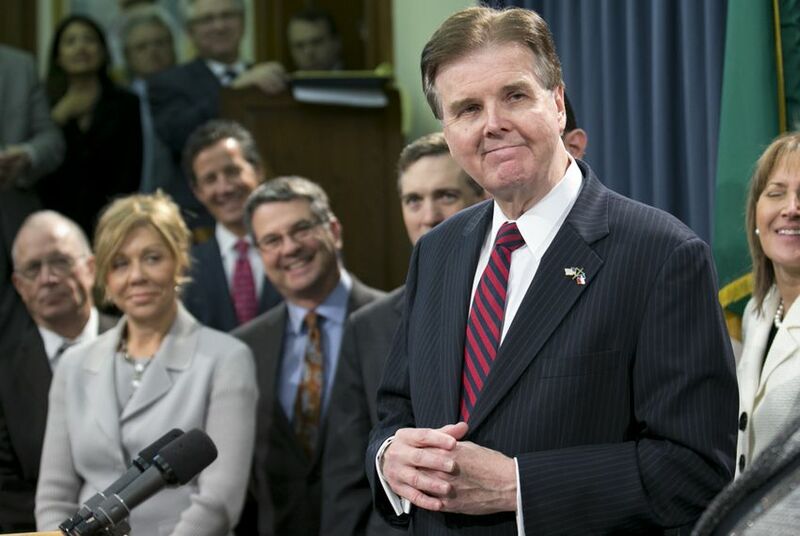 Dan Patrick on Tuesday announced a slate of legislation he said would provide lasting tax relief to businesses and homeowners in Texas. "At the end of the day, the Texas economy stays strong if people have more money in their pocket, if businesses have more money to create jobs," said Patrick, a Republican. Patrick said three recently filed bills — Senate Bills 1, 7 and 8 — would deliver a combined $4.6 billion break from the state's property and business taxes. Patrick said the legislation represented an initial step toward what he said would be further tax breaks — though he declined to say whether those would come during this legislative session. He also emphasized Gov. Greg Abbott's support of the measures. "We are so close shoulder-to-shoulder you couldn't put a piece of paper between us," Patrick said. Abbott responded to Patrick's comments at a news conference later Tuesday morning. He said that while he had yet to look at the legislation announced Tuesday, it appeared similar to what he has proposed in the past. Despite support from the governor — and what Patrick said was a bipartisan group of 24 of the chamber's 31 senators who have signed on to the tax relief package — there are signs that it may encounter opposition. He said wanted to see a long-range plan to fix the significant shortfalls in state-funded pensions and deferred maintenance on state facilities before passing any tax breaks. State Sen. Kirk Watson, the Austin Democrat who leads the party's caucus in the Senate, said in a statement that he supported increasing the homestead exemption. But he added that he "can't get behind" cutting the franchise tax with a school finance case pending before the Texas Supreme Court. Lawyers for the state are currently appealing a trial court ruling that found it inadequately funds public schools. More than two-thirds of the state's school districts brought the lawsuit against the state following deep budget cuts to public education during the 2011 legislative session. "It would be irresponsible to cut off an important stream of revenue before we know what the Legislature's obligations will be to fulfill its constitutional responsibility to Texas schoolchildren," he said. Ryan McCrimmon contributed reporting to this story.